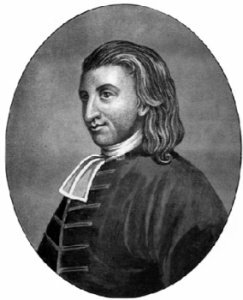 Thomas Boston (1676–1732) was a Scottish clergyman. He was born at Duns. His father, John Boston, and his mother, Alison Trotter, were both Covenanters. He was educated at Edinburgh, and licensed in 1697 by the presbytery of Chirnside. In 1699 he became minister of the small parish of Simprin, where there were only 90 examinable persons; previously, he was a schoolmaster in Glencairn. In 1704 he found, while visiting a member of his flock, a book brought into Scotland by a commonwealth soldier. This was the famous Marrow of Modern Divinity, by Edward Fisher, a compendium of the opinions of leading Reformation divines on the doctrine of grace and the offer of the Gospel, which set off the Marrow Controversy. Its object was to demonstrate the unconditional freeness of the Gospel. It cleared away such conditions as repentance, or some degree of outward or inward reformation, and argued that where Christ is heartily received, full repentance and a new life follow. On Boston’s recommendation, James Hog of Carnock reprinted Marrow in 1718; and Boston also published an edition with notes of his own. The book, being attacked from the standpoint of high Calvinism, became the standard of a far-reaching movement in Scottish Presbyterianism. The ‘Marrow men’ were marked by the zeal of their service and the effect of their preaching. As they remained Calvinists they could not preach a universal atonement; rather they were particular redemptionists. In 1707 Boston was translated to Ettrick, Scotland. He was the only member of the assembly who entered a protest against the lightness of the sentence passed on John Simson, Professor of Divinity at Glasgow, who was accused of heterodox teaching on the Incarnation. Boston’s treatise on evangelism, based on Matthew 4:19. A few good reviews of Manfishing can be found here and here. Also available as a Digital Puritan e-book here. Of Man’s Chief End and Happiness. (1 Corinthians 10:31; Psalm 73:25-26) – pdf, 10 pp. The Divine Authority of the Scriptures. (2 Timothy 3:16) – pdf, 19 pp. The Utility of the Scriptures as a Rule – pdf, 5 pp. The Scope of the Scriptures. (2 Timothy 1:13) – pdf, 15 pp. The Scriptures the Book of the Lord, and the Diligent Study and Search Thereof Recommended. (Isaiah 34:16) – pdf, 21 pp. Of God and His Perfections. (John 4:24) – pdf, 50 pp. Of the Holy Trinity. (1 John 5:7) – pdf, 7 pp. Of the Decrees of God. (Ephesians 1:11) – pdf, 19 pp. Of the Work of Creation. (Hebrews 11:3) – pdf, 11 pp. Of the Creation of Man. (Genesis 1:27) – pdf, 9 pp. Of the Providence of God. (Matthew 10:29) – pdf, 8 pp. The Wise Observation of Providences, Illustrated and Enforced. (Psalm 107:43) – pdf, 36 pp. Of the Covenant of Works. (Genesis 2:16-17) – pdf, 14 pp. Of the Fall of Our First Parents. (Genesis 3:6-7) – pdf, 14 pp. Of Sin in General. (1 John 3:4) – pdf, 11 pp. Of the First Sin in Particular. (Genesis 3:6-7) – pdf, 7 pp. Of Our Fall in Adam. (Romans 5:19) – pdf, 6 pp. Of the Sinfulness of Man’s Natural State. (Psalm 51:5) – pdf, 15 pp. Of the Miseries of Man’s Natural State. (Romans 5:12) – pdf, 9 pp. Of Election to Everlasting Life. (Ephesians 1:3-5) – pdf, 13 pp. Of the Covenant of Grace. (Psalm 89:3; 1 Corinthians 15:45) – pdf, 62 pp. Of Christ the Only Redeemer of God’s Elect. (Galatians 4:4-5) – pdf, 15 pp. Of Christ’s Incarnation. (Luke 1:35) – pdf, 15 pp. Of Christ’s Offices in General. (Zechariah 6:13) – pdf, 8 pp. Of Christ’s Prophetical Office. (Acts 3:22) – pdf, 26 pp. Of Christ’s Priestly Office. (Hebrews 7:17) – pdf, 38 pp. Of Christ’s Kingly Office. (Psalm 2:6) – pdf, 16 pp. Of Christ’s Humiliation. (Philippians 2:8) – pdf, 15 pp. Of Christ’s Exaltation. (Philippians 2:9-11) – pdf, 25 pp. Of the Application of Redemption. (Titus 3:5) – pdf, 15 pp. Of Union With Christ. (1 Corinthians 12:13) – pdf, 13 pp. Of Effectual Calling. (2 Timothy 1:9) – pdf, 19 pp. Of the Benefits of Effectual Calling. (Romans 8:30) – pdf, 5 pp. Of Justification. (Romans 3:24) – pdf, 32 pp. Of Adoption. (2 Corinthians 6:18) – pdf, 31 pp. The Divine Call to Leave the Devil’s Family Explained and Urged. (2 Corinthians 6:17-18) – pdf, 11 pp. Of Sanctification. (1 Corinthians 6:11) – pdf, 9 pp. Union with Christ the Only Way to Sanctification. (1 Corinthians 1:30) – pdf, 10 pp. Of the Benefits Flowing From Justification, Adoption, and Sanctification. (Romans 5:1-2) – pdf, 13 pp. Of Increase of Grace, and Perseverance Therein to the End. (Proverbs 4:18) – pdf, 9 pp. Of the Benefits Which Believers Receive at Death. (Philippians 1:21) – pdf, 5 pp. Of the Benefits at the Resurrection. (Hebrews 11:35) – pdf, 10 pp. Of the Duty Which God Requireth of Man. (1 Samuel 15:22) – pdf, 8 pp. The Moral Law, the Rule of Man’s Obedience. (Romans 2:14-15) – pdf, 7 pp. The Moral Law Summarily Comprehended in the Ten Commandments. (Matthew 19:17) – pdf, 8 pp. Love to God and Our Neighbour, the Sum of the Ten Commandments. (Matthew 22:37-39; Mark 12:30) – pdf, 11 pp. The Preface to the Ten Commandments. (Exodus 20:2) – pdf, 8 pp. Of the First Commandment. (Exodus 20:3) – pdf, 36 pp. Of the Second Commandment. (Exodus 20:4-6) – pdf, 4 pp. The Church’s Prayer Against the Antichristian Beast. (Psalm 74:19) – pdf, 28 pp. Of the Third Commandment. (Exodus 20:7) – pdf, 29 pp. Of the Fourth Commandment. (Exodus 20:8-11) – pdf, 19 pp. Of the Fifth Commandment. (Exodus 20:12) – pdf, 57 pp. Includes “The Duty of Ruling Elders and People” (below). The Duty of Ruling Elders and People. (1 Timothy 5:17) – pdf, 22 pp. Of the Sixth Commandment. (Exodus 20:13) – pdf, 17 pp. Of the Seventh Commandment. (Exodus 20:14) – pdf, 10 pp. Of the Eighth Commandment. (Exodus 20:15) – pdf, 27 pp. Of the Ninth Commandment. (Exodus 20:16) – pdf, 20 pp. Of the Tenth Commandment. (Exodus 20:17) – pdf, 23 pp. Of Man’s Inability to Keep the Law Perfectly. (Ecclesiastes 7:20) – pdf, 10 pp. Of Sin In Its Aggravations. (Ezekiel 8:15) – pdf, 6 pp. Of the Desert of Sin. (Galatians 3:10) – pdf, 5 pp. Of the Means of Salvation in General. (Hebrews 2:3) – pdf, 7 pp. Of Faith in Jesus Christ. (John 1:12) – pdf, 13 pp. Of Repentance Unto Life. (Acts 11:18) – pdf, 6 pp. Of Christ’s Ordinances in General. (Isaiah 12:3) – pdf, 6 pp. How the Word is Made Effectual to Salvation. (Ephesians 6:17) – pdf, 6 pp. How the Word is to Be Read and Heard. (Luke 7:18) – pdf, 8 pp. The Duty of Attending Ordinances Enforced. (Acts 10:33) – pdf, 10 pp. A Caveat Against Receiving the Gospel in Vain. (2 Corinthians 6:1) – pdf, 12 pp. The Danger of Not Complying With the Gospel Call. (Proverbs 9:12) – pdf, 7 pp. How the Sacraments Become Effectual Means of Salvation. (1 Corinthians 12:13) – pdf, 6 pp. The Nature of the Sacraments. (Romans 4:11) – pdf, 6 pp. The Number of the Sacraments, and the Nature of Baptism. (1 Corinthians 12:13; Matthew 28:19) – pdf, 11 pp. The Nature of the Lord’s Supper. (1 Corinthians 11:23-25) – pdf, 8 pp. Of the Worthy Receiving of the Lord’s Supper. (1 Corinthians 11:28) – pdf, 9 pp. The Necessity of Self-Examination Considered. (2 Corinthians 13:5) – pdf, 14 pp. The Danger of Unworthy Communicating. (1 Corinthians 11:29) – pdf, 15 pp. The Nature of Prayer. (Ephesians 6:18) – pdf, 14 pp. A Discourse on Secret Prayer. (Matthew 6:6) – pdf, 16 pp. Of the Rule of Direction in Prayer. (Matthew 6:9) – pdf, 6 pp. The Preface of the Lord’s Prayer. (Matthew 6:9) – pdf, 5 pp. The First Petition. (Matthew 6:9) – pdf, 6 pp. The Second Petition. (Matthew 6:10) – pdf, 16 pp. The Third Petition. (Matthew 6:10) – pdf, 16 pp. The Fourth Petition. (Matthew 6:11) – pdf, 12 pp. The Fifth Petition. (Matthew 6:12) – pdf, 8 pp. The Sixth Petition. (Matthew 6:13) – pdf, 20 pp. The Conclusion of the Lord’s Prayer. (Matthew 6:13) – pdf, 10 pp. Of the Right Improvement of a Time of Sickness and Mortality. (Psalm 90:12) – pdf, 6 pp. Also known as “The Sermon in the Afternoon”. Two forms of personal covenanting by the author – pdf, 4 pp. The Happiness of Fearing Alway. (Proverbs 28:14) – pdf, 8 pp. The Instability of Human Goodness. (Hosea 6:4) – pdf, 9 pp. Rational Evidences from Heaven Illustrated. (Two sermons on 2 Corinthians 5:1) – pdf, 45 pp. The Blessedness of Not Being Offended in Christ. (Matthew 11:6) – pdf, 11 pp. Believers Looking at the Things Which are Not Seen. (Two sermons on 2 Corinthians 4:18) – pdf, 18 pp. Christ Demanding Admission into Sinners’ Hearts. (Psalm 24:9) – pdf, 25 pp. Christ’s Invitation to His Bride. (Song of Solomon 4:8) – pdf, 12 pp. Cautions Against Quenching the Spirit. (1 Thessalonians 5:19) – pdf, 21 pp. Saints Wrestling for the Blessing, and Obtaining It. (Two sermons on Genesis 32:26-29) – pdf, 16 pp. Suitable Improvement of Christ the Apple Tree. (Two sermons on Song of Solomon 2:3) – pdf, 15 pp. The Sins of Sinners Finding Them Out. (Three sermons on Numbers 32:23) – pdf, 35 pp. The Great Danger of Professors Who Hold the Truth in Unrighteousness. (Romans 1:18) – pdf, 39 pp. The Evil of Christ’s Friends Lifting up Their Heel Against Him. (Psalm 41:9) – pdf, 8 pp. Present Room for Sinners in Christ’s House. (Luke 14:22) – pdf, 13 pp. Hungering After Righteousness. (Matthew 5:6) – pdf, 9 pp. Christians Strong in the Grace That is in Christ Jesus. (2 Timothy 2:1) – pdf, 8 pp. Man, Sinful Man, is a Complaining Creature. (Lamentations 3:39) – pdf, 19 pp. The Pleasures of Real Religion. (Proverbs 3:17) – pdf, 38 pp. Those That Are in Christ are Dead to the World. (Colossians 3:3) – pdf, 12 pp. Encouragement to Pray for the Conversion of the Jews. (Zechariah 12:12) – pdf, 18 pp. Thanksgiving for My Continuance in Ettrick. (Proverbs 29:18) – pdf, 7 pp. Unfruitful Professors Cut Down as Cumberers of the Ground. (Luke 13:7) – pdf, 6 pp. The Great Desire of the Saints. (Two sermons on Psalm 4:6) – pdf, 12 pp. The Duty of Yielding Ourselves to the Lord. (2 Chronicles 30:8) – pdf, 14 pp. Amiable Professors Falling Short of Heaven. (Seven sermons on Mark 10:21) – pdf, 83 pp. The Crook in the Lot. (Ecclesiastes 7:13; Proverbs 16:19; 1 Peter 5:6) – pdf, 94 pp. The Unity of the Body of Christ and the Duties the Members Owe One Another. (1 Corinthians 10:17) – pdf, 65 pp. Christ’s People, a Willing People. (Psalm 110:3) – pdf, 11 pp. The Soul’s Espousal to Christ. (2 Corinthians 11:2) – pdf, 10 pp. Serving the Lord in Holiness. (Two sermons on Luke 1:74-75) – pdf, 14 pp. The Leading Privilege of Them that Know the Joyful Sound. (Psalm 89:15) – pdf, 8 pp. The Lord’s Helping His People. (1 Samuel 7:12) – pdf, 9 pp. Mourning the Absence of Christ. (Lamentations 3:49-50) – pdf, 8 pp. The Shortness of Human Life. (Job 16:22) – pdf, 5 pp. A Heart Exercised unto Godliness Necessary to Make a Good Minister. (1 Timothy 4:7) – pdf, 10 pp. A Heart Exercised unto Godliness Necessary to Make a Good Christian. (1 Timothy 4:7) – pdf, 9 pp. The Privileges and Duties of Christ’s Spouse. (Psalm 45:10) – pdf, 37 pp. Christ Jesus Duly Prized. (Eight sermons on Philippians 3:8) – pdf, 71 pp. Man’s Iniquities Testifying Against Him. (Jeremiah 14:7) – pdf, 8 pp. The Unequality of Man’s Ways. (Ezekiel 18:29) – pdf, 7 pp. Duties of Husband and Wife. (Ephesians 5:33) – pdf, 10 pp. Mystery of Christ’s Kingdom Known to Believers. (Mark 4:11) – pdf, 10 pp. The Fruit of the Spirit. (Ephesians 5:9) – pdf, 12 pp. Christ the Life of the Believer. (Philippians 1:21) – pdf, 9 pp. Believers Seeking a Continuing City. (Hebrews 13:14) – pdf, 15 pp. Believers Communing With Their Own Hearts. (Psalm 4:2) – pdf, 7 pp. Ministers in the Church Appointed by Christ. (Ephesians 4:11-12) – pdf, 7 pp. Ministers to Continue Till the Church Be Perfect. (Ephesians 4:13) – pdf, 8 pp. Believers Having Tribulation in the World. (John 16:33) – pdf, 28 pp. Anger Not to Be Sinfully Indulged. (Ephesians 4:26-27) – pdf, 8 pp. Christ the Physician of Souls. (Matthew 9:12) – pdf, 28 pp. Christian Watchfulness Stated and Enforced. (Mark 13:37) – pdf, 8 pp. God Hiding His Face from Backsliders. (Isaiah 64:7) – pdf, 44 pp. On the Government of the Tongue. (James 3:6) – pdf, 10 pp. On the Duty of Praying for the Peace of the Church. (Psalm 122:6) – pdf, 6 pp. Duty and Advantage of Solemn Meditation. (Genesis 24:26) – pdf, 5 pp. Farewell Sermon at Simprin. (John 7:37) – pdf, 8 pp. The Distinguishing Characters of Real Christians – pdf, 85 pp. A Soliloquy on the Art of Man-Fishing – pdf, 39 pp. Also available as an e-book from Digital Puritan Press here. The Distinguishing Characters of True Believers. In Relation to God in Christ, as Their Refuge and Portion. Psalm 142:5. In relation to God in Christ, as their refuge and portion. (Psalm 142:5) – pdf, 11 pp. Faith’s Recognition of Taking God for a Refuge and Portion, Illustrated. (Psalm 142:5) – pdf, 13 pp. God in Christ the Believer’s Portion. (Psalm 142:5) – pdf, 24 pp. In Relation to Their Disposition and Practice as Citizens of Zion. Psalm 15:1-2. The Citizen of Zion Described. (Psalm 15:1) – pdf, 10 pp. The Citizen of Zion an Upright Walker. (Psalm 15:2) – pdf, 9 pp. The Citizen of Zion a Worker of Righteousness. (Psalm 15:2) – pdf, 11 pp. The Citizen of Zion a Speaker of Truth in His Heart. (Psalm 15:2) – pdf, 12 pp. In Relation to Their Speech, and Reverence of God’s Name. (James 5:12) – pdf, 18 pp. In Relation to Their Meekness, as an Evidence of Great Understanding, and the Folly of Passion. (Proverbs 14:29) – pdf, 21 pp. In Relation to Their Forgiving Injuries, in Opposition to Revenge. (Romans 12:19) – pdf, 10 pp. In Relation to Loving Their Enemies. (Matthew 5:44-45) – pdf, 20 pp. In Relation to Their Carriage in a Time of Abounding Sin, and Their Safety in a Suffering Time. (Ezekiel 9:4). The Character of Zion’s Mourners. (Ezekiel 9:4) – pdf, 9 pp. Advice to Zion’s Mourners. (Ezekiel 9:4) – pdf, 11 pp. In Relation to Their Friendship to Christ, and Evidencing It, by Doing Whatsoever He Commands Them. (John 15:14) – pdf, 27 pp. In Relation to Their Work in This Life, and Their Journey to the Other World. (Ecclesiastes 9:10) – pdf, 24 pp. In Relation to the Happy Effect of Christ’s Good-will in the Word of Grace. (Luke 19:5) – pdf, 9 pp. In Relation to Their Entering Into Rest in Christ. (Hebrews 4:3) – pdf, 18 pp. The State and Character of Believers. (1 John 5:9) – pdf, 49 pp. The divine call to sinners to come out from among the world lying in wickedness, explained and urged. (1 John 5:9; 2 Corinthians 6:17) – pdf, 26 pp. The believer’s hundredfold in this life considered; and a view of the reality, parts, inhabitants, passage into, and state of men in the world to come. (Mark 10:30) – pdf, 70 pp. The great care concerning now, that our souls be not gathered with sinners in the other world, considered and improved. (Psalm 26:9) – pdf, 18 pp. The improvement of life in this world to the raising of a good name, the best balance for the present, for the vanity and misery of human life, and the good man’s dying day better than his birth-day. (Ecclesiastes 12:1) – pdf, 41 pp. Christ’s special order for gathering his saints to him at the last day, with their distinguishing character, as entering into his covenant now, considered. (Psalm 50:5) – pdf, 25 pp. The saints’ lifetime in this world a night-time; their expectation of the day’s break in the other world, and the shadows fleeing away; and their great concern for Christ’s presence till that happy season come. (Song of Solomon 2:17) – pdf, 32 pp. Readiness for our removal into the other world opened up, urged, and enforced. (Luke 12:40) – pdf, 31 pp. The peculiar advantage and business of life opened up, and applied. (Isaiah 38:19) – pdf, 47 pp. Whether or not the sins of believers, while unrepented of, make them liable to eternal punishment? pdf, 33 pp. Whether or not all sins, past, present, and to come, are pardoned together and all at once? pdf, 33 pp. Whether or not repentance be necessary in order to obtaining the pardon of sin? pdf, 24 pp. Where hath sin its lodging-place in the regenerate? pdf, 11 pp. Why the Lord suffereth sin to remain in the regenerate? pdf, 15 pp. A meditation on the day of expiation, and the feast of tabernacles – pdf, 7 pp. Arguments from Scripture and reason, proving conservation to be a positive act, or a continued creation – pdf, 8 pp. Of the origin, names, texture, and use of garments – pdf, 8 pp. A paraphrase upon the Epistle to the Galatians – pdf, 38 pp. Gospel-Compulsion. (Luke 14:23) – pdf, 15 pp. Christ, the Saviour of the World. (1 John 4:14) – pdf, 12 pp. The Necessity of Self-Denial. (Luke 9:23) – pdf, 13 pp. The Old and New Man in Believers. (Romans 6:6) – pdf, 9 pp. Worm Jacob Thrashing the Mountains. (Isaiah 41:14-15) – pdf, 13 pp. The Necessity of Praying Always and Not Fainting. (Luke 18:8) – pdf, 14 pp. The Happy Issue of Praying Always and Not Fainting. (Luke 18:8) – pdf, 12 pp. The Strength of Christ Illustrated in the Weakness of His People. (2 Corinthians 12:9) – pdf, 12 pp. The Necessity of Repentance. (Luke 13:5) – pdf, 73 pp. The Danger of Delaying Repentance. (Proverbs 6:10-11) – pdf, 20 pp. The Extraordinary Case of the Thief on the Cross, No Argument for Delaying Repentance. (Luke 23:42) – pdf, 14 pp. God’s Delay of Executing the Sentence of Condemnation Against Ungodly Men Often Miserably Abused by Them. (Ecclesiastes 8:11) – pdf, 45 pp. The Sinfulness and Hazard of Profession of Religion Without a Corresponding Practice. (Luke 6:46) – pdf, 25 pp. The Inseparable Connection Between a Sinner’s Having Part With Christ, and Being Washed by Him (or The Mystery of Sanctification by Christ Opened Up, part 1). (John 13:8) – pdf, 11 pp. The Mystery of Sanctification by Christ Opened Up (part 2). (John 13:8) – pdf, 59 pp. The Christian Warfare (or, The Good Fight of Faith). (1 Timothy 6:12) – pdf, 64 pp. A brief explication of the first part of the Assembly’s Shorter Catechism – pdf, 34 pp. The Marrow of Modern Divinity – indexed searchable pdf, 347 pp. The transcript of a fictional discussion, which explains the main points of doctrine of the Christian faith, with explanatory footnotes. The Everlasting Espousals. (Hosea 2:19) – pdf, 29 pp. The Mystery of Christ in the Form of a Servant. (Philippians 2:7) – pdf, 27 pp. The Peculiar Mystery and Business of Life Opened Up and Applied. (Isaiah 38:19) – pdf, 46 pp. The Evil and Danger of Schism. (1 Corinthians 1:10) – pdf, 43 pp. The Necessity and Foundations of a Throne of Grace for the Behoof of Poor Sinners, Pointed Out and Illustrated. (Psalm 89:14) – pdf, 22 pp. The Evidences and Causes of the Decay of Religion in the Soul Discovered, and the Method of Its Cure Prescribed. (Revelation 3:2) – pdf, 15 pp. Man’s Fourfold State – searchable indexed pdf, 372 pp. The State of Innocence (Ecclesiastes 7:29) – pdf, 17 pp. The Sinfulness of Man’s Natural State (Genesis 6:5) – pdf, 72 pp. The Misery of Man’s Natural State (Ephesians 2:3) – pdf, 28 pp. Man’s Utter Inability to Recover Himself (Romans 5:6; John 6:44) – pdf, 14 pp. On Regeneration (1 Peter 1:23) – pdf, 40 pp. Mystical Union Between Christ and Believers (John 15:5) – pdf, 55 pp. On Death (Job 30:23) – pdf, 14 pp. The Difference Between the Righteous and the Wicked in their Death (Proverbs 14:32) – pdf, 26 pp. Of the Resurrection (John 5:28-29) – pdf, 19 pp. Of the General Judgment (Matthew 25:31-34,41,46) – pdf, 28 pp. The Kingdom of Heaven (Matthew 25:34) – pdf, 32 pp. Of Hell (Matthew 25:41) – pdf, 29 pp. A View of the Covenant of Grace from the Sacred Records (Psalm 89:3) – indexed searchable pdf, 228 pp. Infallible antidotes against unbelieving fears (Revelation 1:17-18) – pdf, 15 pp. Sin, that which separates God and men (Isaiah 59:2) – pdf, 10 pp. The folly of resisting, the wisdom of complying with the Gospel call (Matthew 21:29) – pdf, 9 pp. The nature and effects of a weaned disposition of soul (Psalm 131:2) – pdf, 9 pp. The danger of not waiting on God after the due order (1 Corinthians 15:13) – pdf, 19 pp. The perfection of providential dispensations (Psalm 18:30) – pdf, 5 pp. Fear and hope, objects of the divine complacency (two sermons on Psalm 147:11) – pdf, 30 pp. Jesus victorious over death (two sermons on Isaiah 25:8) – pdf, 17 pp. The suitable improvement of saints’ former experiences (two sermons on 2 Kings 1:14) – pdf, 18 pp. Christ, the Father’s gift to his chosen people (Isaiah 55:4) – pdf, 10 pp. The Christian weak, yet strong (two sermons on 2 Corinthians 12:10) – pdf, 15 pp. The interesting inquiry (Matthew 20:6) – pdf, 8 pp. Christ’s presence with Gospel ministers (Matthew 28:20) – pdf, 10 pp. Christ’s invitation to the labouring and heavy-laden (four sermons on Matthew 11:28) – pdf, 51 pp. Christ, a refreshful shadow in a weary land (two sermons on Isaiah 32:2) – pdf, 25 pp. The evil and danger of halting between two opinions (two sermons on 1 Kings 16:21) – pdf, 19 pp. Creation’s groans considered and improved (two sermons on Romans 8:22) – pdf, 23 pp. Creation’s travail and delivery (Romans 8:22) – pdf, 14 pp. Faithfulness towards God exemplified and rewarded (two sermons on Numbers 14:24) – pdf, 36 pp. The Christian described, the hypocrite detected (two sermons on Romans 2:28-29) – pdf, 35 pp. The statute law of discipleship (two sermons on Luke 14:26) – pdf, 17 pp. A rich reward to diligence in religion (two sermons on Hosea 6:3) – pdf, 17 pp. The acceptable manner of drawing near to God (three sermons on Hebrews 10:22) – pdf, 41 pp. The saints God’s servants, and his property (three sermons on Acts 27:23) – pdf, 43 pp. God’s gracious call and precious promise considered (Psalm 81:10) – pdf, 9 pp. The nature and source of spiritual life (John 6:57) – pdf, 10 pp. The folly of turning aside from the Lord (1 Samuel 12:21) – pdf, 8 pp. Jesus completely qualified for his work (two sermons on Isaiah 61:1) – pdf, 22 pp. Jesus a preacher of good tidings to the meek (two sermons on Isaiah 61:1) – pdf, 21 pp. Jesus binds up the broken-hearted (two sermons on Isaiah 61:1) – pdf, 20 pp. Jesus proclaims liberty to the captives (two sermons on Isaiah 61:1) – pdf, 21 pp. Jesus opens the prison doors to the prisoners (two sermons on Isaiah 61:1) – pdf, 32 pp. Departing from iniquity the duty of all who name the name of Jesus (four sermons on 2 Timothy 2:19) – indexed searchable pdf, 45 pp. The inward frame should correspond with the outward profession (two sermons on Deuteronomy 5:29) – indexed pdf, 32 pp. A rich feast prepared for hungry souls (Isaiah 25:6) – pdf, 12 pp. The distinguishing privilege of God’s faithful servants (Exodus 24:11) – pdf, 14 pp. Gospel privileges wonders of grace (Exodus 24:11) – pdf, 9 pp. God not ashamed to be called his people’s God (Hebrews 11:16) – pdf, 13 pp. The best security against the day of wrath (Hebrews 11:28) – pdf, 13 pp. The sin of people’s forsaking God, and betaking themselves to the creature in his stead (Jeremiah 2:13) – pdf, 33 pp. The birth, gift, government, and glorious names of Jesus Christ, as Saviour of sinners (Isaiah 9:6) – pdf, 5 pp. Christ presented to mankind sinners (Isaiah 9:6) – pdf, 7 pp. Christ, the Son of God, gifted to sinners (Isaiah 9:6) – pdf, 15 pp. The government on Christ’s shoulder (Isaiah 9:6) – pdf, 12 pp. Christ’s name above every name (Isaiah 9:6) – pdf, 2 pp. Christ’s name wonderful (Isaiah 9:6) – pdf, 17 pp. Christ the counselor (Isaiah 9:6) – pdf, 20 pp. Christ the mighty God (Isaiah 9:6) – pdf, 4 pp. Christ the everlasting Father (Isaiah 9:6) – pdf, 5 pp. Christ the Prince of Peace (Isaiah 9:6) – pdf, 9 pp. The unsuccessfulness of the gospel, the nature of the gospel-report, the rarity of believing it, and the necessity of divine power in order to faith (Isaiah 53:1) – pdf, 41 pp. The way to life, and the way to destruction unfolded (Matthew 7:13-14) – pdf, 88 pp. The duty and advantage of cleaving to the Lord and his way, in a declining time (Genesis 6:9) – pdf, 18 pp. Perilous times in the last days (2 Timothy 3:1) – pdf, 7 pp. The end of time, and the mystery of God finished with it (Revelation 10:6-7) – pdf, 42 pp. Walking by faith, not by sight (3 sermons on 2 Corinthians 5:7) – indexed pdf, 24 pp. Christ to be found in the ordinances, with the import and happy effects of finding him (Proverbs 8:35) – pdf, 32 pp. Sinners interested in Christ, obtaining favour of the Lord (Proverbs 8:35) – pdf, 13 pp. Unbelief the sin against Christ by way of eminence, and the wrong done to the soul thereby (Proverbs 8:36) – pdf, 18 pp. Believers a mystery, with a description of their travels from the wilderness of this world, to the heavenly Canaan, leaning upon Christ (Song of Solomon 8:5) – pdf, 30 pp. Enoch’s character and translation explained, with a description of walking with God, as that in which the life of religion lies (Genesis 5:24) – pdf, 57 pp. Discourses on Prayer – indexed searchable pdf, 162 pp. On the nature of prayer in general; with the import of praying without ceasing (1 Thessalonians 5:17) – pdf, 11 pp. Of the Spirit’s help in prayer (Romans 8:26) – pdf, 63 pp. Of praying in the name of Jesus Christ (John 16:23) – pdf, 17 pp. Of God’s hearing of prayer (Psalm 65:2) – pdf, 27 pp. On acceptance with God (2 Corinthians 8:12) – pdf, 26 pp. Jesus Christ the Beloved One, and sinners accepted of God freely in him (Ephesians 1:6) – pdf, 22 pp. A view of the Covenant of Works from the Sacred Records (Genesis 2:17; Hosea 6:7; Romans 5:19; Galatians 3:10) – pdf, 168 pp. A Memorial Concerning Personal and Family Fasting and Humiliation (Zechariah 12:12) – indexed searchable pdf, 53 pp. This volume contains the author’s own memoir, from the recollections of his childhood until the illness that ultimately took his life. This volume also contains an appendix. A nice review of this book can be found here. This is a well formatted version, not a scanned lithograph. See also The Complete Works of Thomas Boston, volume 8 (above) for an indexed, searchable copy. The Excellency of the Knowledge of Christ Crucified. (1 Corinthians 2:2) – pdf, 21 pp. The True Christian’s Burden, and Exercise Under It. (Romans 7:24) – pdf, 17 pp. Jacob Wrestling with the Angel, Obtains the Blessing. (Genesis 32:26) – pdf, 19 pp. The Nature of Seeking a Crucified Christ, and the Encouragement Given to Those Who Seek Him, Opened Up and Illustrated. (Matthew 28:5) – pdf, 17 pp. The Nature of Finding Christ Explained, and the Privileges Enjoyed by Those Who Have Found Him Opened Up. (John 1:41) – pdf, 13 pp. The Great Advantage of Afflictions to the People of God. (Genesis 42:36) – pdf, 16 pp. The Nature of and Obligations to Resignation to the Will of God. (2 Samuel 15:26) – pdf, 27 pp. Love to God Illustrated and Enforced. (Mark 12:30) – pdf, 27 pp. The Duty of Loving Our Neighbour Illustrated. (Mark 12:31) – pdf, 17 pp. Christ’s Victory and Triumph Over Principalities and Powers. (Colossians 2:15) – pdf, 13 pp. The Nature of Unbelief Opened Up, and its Pernicious Influence Upon Professors of the Gospel Illustrated, part 1. (Hebrews 3:12) – pdf, 19 pp. The Nature of Unbelief Opened Up, and its Pernicious Influence Upon Professors of the Gospel Illustrated, part 2. (Hebrews 3:12) – pdf, 13 pp. Want to discuss something pertaining to Thomas Boston? Leave a public comment below (subject to moderation), or send a private message to the webmaster. The sermons by Thomas Boston printed with James Blaine’s works are not by the same Thomas Boston. They are by his son, Thomas Boston Junior, minister in the Relief Church. This is a common mistake to make. They are still good reading, he followed his father’s mould. Thank you for clarifying this! I will review these texts (and probably remove them).